If you are one of the thousands of men or women who find themselves unhappy with their facial appearance due to the signs of aging or a significant weight loss, it could be time for a facelift. Daniel Man, M.D., a Florida board-certified plastic surgeon, performs facelift procedures on individuals living Boca Raton, FL, and the surrounding areas to reveal a youthful and rejuvenated appearance. A facelift (also known as rhytidectomy) is designed to be a comprehensive approach to treating more extensive facial wrinkles and sagging caused by aging. It can remove excess skin, tighten underlying tissues and muscle, and lay the skin on the face in such a way to create a smoother complexion. The traditional facelift is long considered to be the ‘gold standard’ for facial rejuvenation. Dr. Man uses a modified version called the “natural facelift” that concentrates on leaving the face looking younger without a stretched, mask-like appearance or a change in the position of the ears as many facelift procedures tend to do. The natural facelift may be combined with additional procedures on the upper half of the face as well as the neck for a complete rejuvenation. A facelift may be right for you if you have a desire to restore your face to the appearance of a younger version of yourself. It is important to have realistic expectations and a healthy attitude towards any cosmetic procedure. Other factors that could make you a good candidate is if you feel as though your facial appearance is affecting your social life or career, or if you show excessive signs of aging, including sagging skin, deeper wrinkles, and creases. How Involved is a Facelift? A facelift is a fairly involved cosmetic procedure. Most facelift techniques focus on the lower facial areas, such as the jawline, jowls, and cheeks; however, they may also be combined with a brow lift and/or a neck lift for a complete facial rejuvenation. Additionally, the procedure may use techniques to reposition deeper facial muscles to restore a more youthful contour. Most facelift procedures will take at least two to four hours depending on the amount of work being done. Safety measures during surgery include multiple monitors in the surgical suite being used to monitor blood pressure, heart rate, pulse, and oxygen levels. Dr. Man performs a “natural facelift” designed to avoid the stretched, tight, and unnatural appearance of many facelift procedures. The result is a younger, relaxed look and a proportionate face. Incisions are hidden inside the ears, providing amazing facelift results without obvious scars. Dr. Man considers the way the eyebrows and forehead interact with the sides of the face, the cheeks, and the mouth when smiling to minimize the chance of a “frozen” expression many people associate with facelifts. With the natural facelift, there are two absorbable stitches by each ear to keep the ears from being pulled out of place during the procedure. The rest of the procedure targets specific problem areas, striving to maintain the way each part of the face works with the other parts. With the ears anchored in their original position, the facelift can proceed with much of the work being done below the surface of the skin. Dr. Man repositions underlying connective tissue and removes excess fat and skin. By doing this, less skin must be removed compared to a traditional facelift. He also often uses harvested fat to fill in the face, restoring the natural contours, so the complexion is smoother and more youthful looking. He may also perform other procedures, including neck and brow lifts as well as eyelid lifts and cheek/chin enhancements, to give the face a more naturally younger look. Once the work is complete, the skin is placed over the newly rejuvenated facial structure and stitched together. Drainage tubes may be inserted to remove any excess fluid, and a padded, supportive dressing is applied. 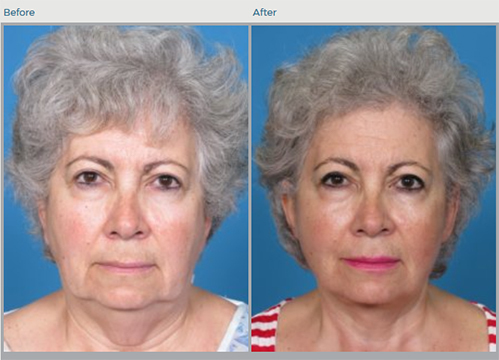 The natural facelift uses absorbable stitches whenever possible so healing can occur at a natural rate. There is also less scarring with this kind of facelift since sutures are hidden inside the ears. This type of facelift is non-invasive and deals with volume loss and a lack of skin laxity by instantly lifting the skin and boosting collagen production. An InstaLift uses dissolvable sutures and cones made of polylactic acid, an ingredient found in Sculptra®, to repair deep tissue while increasing collagen production, which takes over to add volume to the skin. The InstaLift procedure takes about 45 minutes and does not involve incisions or anesthesia but uses lidocaine to make sure there is no discomfort during the treatment. AccuLift is an advanced facial rejuvenation procedure performed with the safe technology found in the AccuSculpt™ 1444 laser. This procedure was developed to meet the needs of patients wanting immediate, significant, and lasting results with minimal downtime. AccuLift can be used for immediate improvement in common problem areas, such as under-eye bags, sagging cheeks, and jowls, or loose skin under the chin. The patented 1444 nm wavelength laser has been clinically proven to be the most accurate, precise and effective wavelength for fat removal and tightening of loose, sagging skin. After the facelift is complete, the surgical team applies surgical dressings to support and protect your face. At that point, patients are taken to a recovery area to be closely monitored until the anesthesia wears off. Patients need someone stay with them for the first 24-48 hours after the surgery. If that is not possible, they may stay overnight at our center the first night following surgery to receive care during that time and allow for complete rest. Our nurses are all ACSL certified, and our facility has specialized recovery options, including chest wall cooling methods to reduce pain and swelling, a hyperbaric chamber, and oxygen treatments to speed healing. Depending on the extent of the procedure, patients’ faces may be wrapped in a compression wrap to help the healing process. This wrap should only be removed as directed by Dr. Man. Pain and discomfort should be mild to moderate for the first 48 hours and may be controlled with oral medications. There may be bruising and swelling that peaks within the first 36-48 hours after surgery, as well as some drainage for the first 48 hours. How is the Recovery from a Facelift? 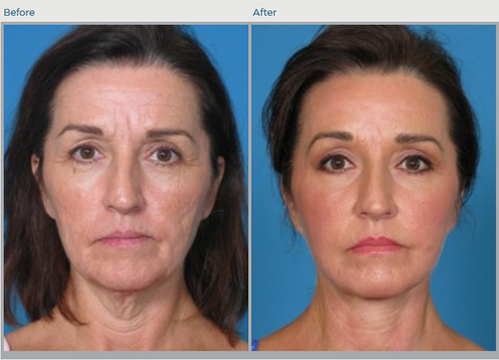 The recovery from a facelift may take more time than with other facial surgeries. Swelling and bruising will gradually subside over the next 10-14 days. Dr. Man provides strict aftercare instructions to help the healing process. It is important to follow all postoperative instructions, including information about bandages, drains, antibiotics (if prescribed), and signs of infection. Recovery time will vary by patient and extent of your surgery. Patients must keep their heads elevated even while sleeping to reduce swelling. They must also avoid washing their hair for the first 24-48 hours and should not use a hairdryer for the first week. The first post-op visit is typically scheduled about three to five days following the surgery then again two weeks later. Dr. Man reviews the healing process and checks to make sure it is progressing in a positive manner. Following the two-week visit, patients return for additional follow-ups at approximately four weeks, three months, six months, and one year following the surgery. Follow-up care is important to check for any complications. The cost of a facelift varies with each patient depending on the type of procedure, its extent and whether it is combined with other cosmetic procedures or treatments. During a consultation with Dr. Man, he goes over the estimated cost and reviews payment and financing options. Your facelift consultation is a chance for your plastic surgeon to get to know you and your goals, evaluate your face, and discuss possible treatment options with you. There may be alternative or additional treatments that are beneficial to you. Dr. Man wants you to know about and understand all aspects of facelift surgery, including your options and expectations, as well as the ramifications of surgery. Florida board-certified plastic surgeon Daniel Man, M.D., performs facelifts on the residents of Boca Raton, FL, and the surrounding communities who want a smoother complexion that looks natural and younger. Please contact us to set up your consultation today.